It is birthday season over here at the Grosgrain Green ranch. Every family has one. The birthday month during which it seems that EVERYONE has their birthday. Actually we have 2. December is actually worse for P and his family (me, his sister, one of his brothers, his mum, his brother in law, even an auntie), but June is pretty bad too. First we have my mum, then in the course of a single week: P's niece, Small Boy and P. And don't forget we have Father's Day in there too (x 2 for me - presents for both P and my actual dad), plus my sister's wedding anniversary and for a short while, my brother's too! And so, last weekend we celebrated Small Boy's third birthday! Where oh where has the time flown? I just cannot believe that 3 years ago he was a teeny 7lb 11oz baby, 13 days overdue and still protesting that he wanted to stay in there (an emergency c-section was the only way to persuade him to come out as, as it turned out, he was anterior - facing the wrong way). It's been a great 3 years. So weird to think he wasn't always walking and talking and having opinions, and eating 2 breakfasts every day and singing These Boots Are Made for Walking and quoting Lion King ("I laugh in the face of danger, ha ha ha. What's "danger" mummy?")! The third birthday, in our house anyway, meant 2 parties and therefore 2 cakes. You can probably imagine how my weekend went. Baking and cleaning and buying food and wrapping pass the parcel, followed by baking and cleaning and making tea and wrapping pass the parcel. Here are the cakes that I made! My mum, ensuring that the candles didn't blow out in the wind. Obligatory jelly and ice cream in the background! Sunday's party, which was family only, called for a dinosaur cake! I wish we'd got a better picture, because I am particularly proud of those wee dinosaurs. I did use cookie cutters to cut out the shapes, but the details, including eyes, dots, toes, the triangles on the back of the T Rex - their personalities - were added by hand! I made a fantastic discovery in the supermarket which was ready-coloured fondant icing which was a real time and effort saver, not to mention giving me the bonus of avoiding oddly stained hands from liquid food colouring! Suffice to say, Small Boy loved it, as did everyone else and it was very quickly scoffed! The cake was a madeira, made from one of my sister's recipe books. It calls for a ridiculous 8 eggs, and about a million grams of flour, but then it is a 22" cake! The "background" icing was orange flavoured butter icing (flavoured with the grated peel of one orange). This was for the friends party on Monday and was a fantastic Nigella recipe (Old Fashioned Chocolate Cake from Feast) where you chuck everything in a food processer. Brilliant! And it was very tasty too. Decorated, as you can see, in the classic Brit style: with Smarties! Actually, for those of you interested in baking and icing cakes, Nigella had a fantastic tip: tear 4 strips of greaseproof paper and make a square with them, placing the cake on top (on your serving plate, obvs), so that the paper is poking out the side. Ice the cake. Once the icing is set, gently pull out each strip of paper, leaving an iced cake on a perfectly clean plate! Genius! On a much brighter note than my last post, I received a lovely package through the post today. I had decided to sign up to Kerry of Kestrel Makes' Spring Sewing Swap because it sounded exciting and who doesn't love to receive a nice package of sewing related stuff through the post? It certainly gave me a lovely end to a fairly crappy week! I was paired up with Claire of Ragbags and Gladrags. We exchanged a number of emails describing our likes, our style and our inspiration (a lot of which were uncannily similar) and I had a nice browse around her website too. And so to the goodies. And what goodies! Interesting looking book on dying fabric. This isn't something I've done before, so I'm looking forward to having a proper read of this when I get a chance. A metre of this really cute floral cotton, or possibly cotton mix. This will make a really cute little summer blouse. Just need to find the perfect pattern. Some cute little trims and notions. A navy lace, a white/cream elastic lace, purple beaded trim and green grosgrain (how apt! :)), plus a pink floral corsage! Some jewellery beads (sorry, my camera is not good at focussing in on little things). And finally this absolutely beautiful beaded and sequinned, embroidered orange fabric. I'm not sure if this is maybe sari fabric? It's quite narrow and as you can see the embroidered/beaded section doesn't run the length of the fabric. I don't know what I'll do with this because I don't think I could ever bear to cut into it. It's just too beautiful. But I will enjoy admiring it, draping it over me, fondling it and just appreciating it's beauty! Didn't I do well? Such a lovely package of amazing items. I actually feel quite guilty. My own package was much smaller in comparison with far fewer items, as I really struggled to get a lot for the budget. In general, most people seem to have done better at than than I did, so not sure where I'm going wrong! I am clearly shopping in the wrong places. Either that or everyone else knows that you are meant to disregard the rules of the swap, and they haven't yet let me in on the secret! Thank you Claire for such a lovely selection of stuff, and thank you Kerry for organising the swap! It was great fun and it has really cheered me up this week! So, although I did have a lovely, relaxing, enjoyable holiday with my family the other week, unfortunately it didn't have such a fantastic ending. On the Thursday, our last full day away, I took a call from my Director (my boss's boss), advising me that my role, and that of my team, are being outsourced and moved 300 miles away! And those of my boss, my close colleague and her team are being moved 400 miles away (although will remain within the company). We have the option of moving, but then we don't really, because the structure is changing and the headcount will be fewer and some of those roles left will only be temporary, but they don't really know what it will look like yet, but do we want to consider moving? And so we are left in limbo. An entire team of 20 people, a key part of the operation, with a huge range of responsibilities, engagement in a number of on-going projects, a large internal customer base and a far-reaching number of stakeholders, no longer required. Of course it will never work. You can't take the work of 5 and reduce it to 1, the work of 7 and reduce that to 2 without disaster occuring somewhere. Systemisation will only take them so far. We could have told them that, had they bothered to ask. So. What will I do next? I don't know. I've been here for 6 years, so will receive a fairly decent redundancy package. I have enjoyed working for my company and in one sense would like to continue here, but I'm no longer certain I have faith that the directors will continue to make the right decisions. I'm also not sure there will be anything for me. I can take my package and look externally, but again, I don't know what's out there. I will also lose certain benefits, like the ability to work part time, and any enhanced maternity benefits, should I manage to have another child. The thought of losing my Mondays with my Small Boy is the only part that's made me tearful! Nothing is certain yet. We are going through a consultation process. If no one wants to relocate, there will then be a transition/hand over period. No one can tell us when this will be, what it will involve, or how long it will take, making it pretty impossible to make any decisions right now. All I know is I'm frustrated, peed off, upset, disappointed, scared, worried, angry and vaguely hysterical. Sorry for the depressing, totally off-subject post, but I guess I wanted to get it down. I am aware countless people go through this all the time, but I still need to work through it and feel sorry for myself a bit. No idea what any of this means to my sewing. I'll need some interview clothes (maybe I could borrow Katy's dress idea? ), but I'm not sure how much time and energy I'll have to devote to sewing or writing over the next wee while - not to mention how much cash I'll have to spare on supplies! Then again, it might prove to be a good distraction. So bear with me, please. Normal service will resume. Eventually. 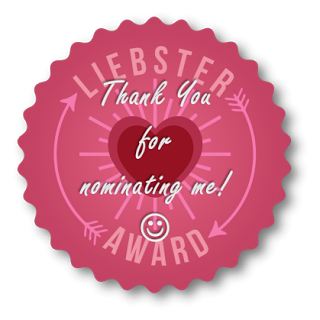 I have been nominated for another Liebster! The lovely Joanne from Sew Little Time was kind enough to nominate me this time around. Joanne and I "found" each other during Me Made May via the Flickr group, which was a really great way to discover other blogs out there! This is the second time of being nominated but I am as grateful as I was the first time, so I will happily answer Joanne's questions. Cinema Paradiso because it's a great story and the bit at the end where Salvatore watches the film reel and it's a montage of all the kisses that the Priest had had cut from films over the years always makes me cry. It's a cheesy film, but I love it. 2. What kind of holidays do you like - beach? city break? raving in Ibiza? Do tell! I think I've just been on my favourite kind of holiday. I love a city break but since I had Small Boy, I like something easy. A self-catering house, with outside space for Small Boy to entertain himself. Some culture, some time in the open air, the chance to wander round some nice wee shops and lots of lovely food make the ideal holiday for me. Guaranteed sun, but not too hot would make it absolutely perfect! 3. I spend a lot of time commuting - if you had a spare hour on the train, what would you do? Look out of the window. I rarely get the chance to just sit and do nothing, so I relish train and bus journeys for just that reason (I commute to work by car). 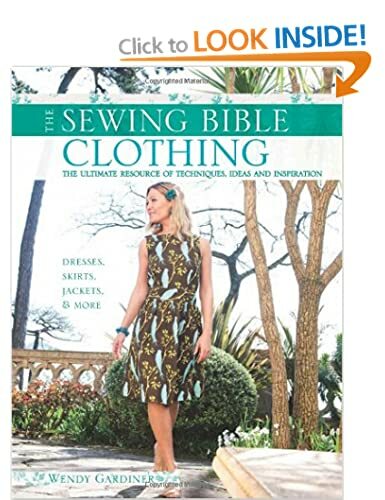 Last year I came across and borrowed "The Sewing Bible Clothing" by Wendy Gardiner from the library. I found it to be a really useful reference book and have since bought it. It's nothing fancy and the photos are quite dated, but it's really informative. I also love the Colette Handbook (although I haven't made any of the patterns) and an ancient copy of the Reader's Digest Complete Guide to Sewing. Wovens. I have only sewed with knits once. It was OK, but I prefer sewing with wovens. I probably should try knits again though. Not least because I have some in my stash! Aahhhh, that's so tricky! I have a real soft spot for Miss P because it was one of the first sewing blogs I discovered and I feel like I have an affinity with her because we are the same age, our birthdays are in the same month and we both have small boys. I think though, my actual favourite now might be Lladybird. She is so honest and candid in her writing, she makes me laugh, she is supercool and very talented, not to mention a very prolific sewer, with a sewing room to die for! I don't do any other crafts. I would like to try quilting, but I only really want to make one quilt. My other hobbies include gardening, cooking and baking. 8. I am not a karaoke person at all, but if I were it would probably be "Mr Brightside" by the Killers, as it's my favourite song to dance to. Although that strikes me as probably being difficult to sing! Mostly sweet but I do love cheese! At the moment, my new sunglasses. I finally got round to investing in a pair of prescription sunglasses this summer and I LOVE them! They are Calvin Klein and purple! Only £50! :) Hmmm. Another tricky one, but I think it might be this: Deer and Doe Datura blouse in this coral habotai silk, perhaps colour blocked with something like this aqua colour? I actually have no idea whether this would work or not, but in my head it's gorgeous! If there was any money leftover, I'd spend it on Liberty fabric! 1. 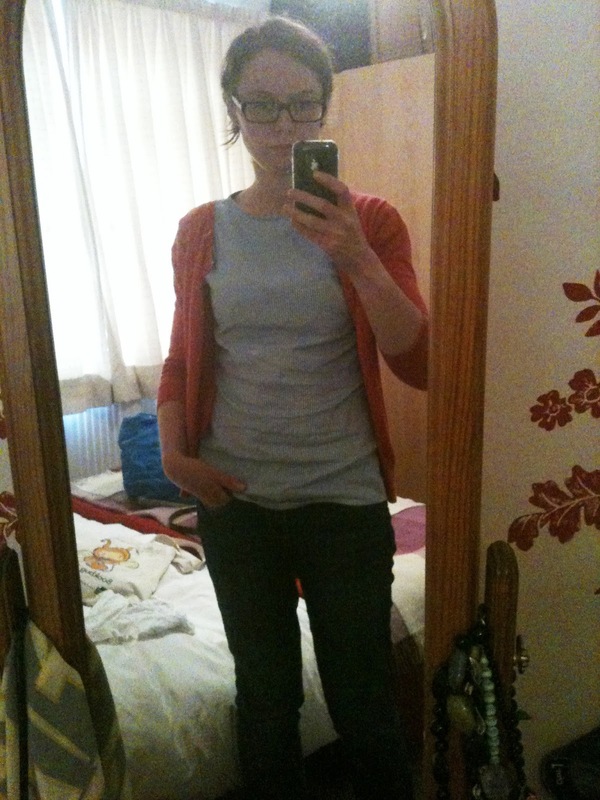 My favourite colour is green, hence my blog name, but at the moment I seem to be mildly obsessed with coral/orange. 3. I was Best Man for my friend Mark, at his wedding. 4. We live in a tiny 2 bedroom garden flat, but we love the area (and it has great schools! ), so we hang on in there and buy lottery tickets every week in hope! 5. I have knobbly knees. But then you've seen photos of me. You know that. 6. I lived in London for 6 years, which I loved, but I love Edinburgh even more. 8. I really, really, really want to make more garments but just can never seem to find the time. I have so many plans in my head and most of them never get actualised! 9. I enjoy writing my blog more than I ever thought possible. 10. My husband and I have a bit of an addiction to buying art. We don't buy anything expensive, but most holidays seem to result in us buying just one more print. As a result, we have no more space left to hang them (see point 4). It didn't stop us buying another print on this last holiday! 11. My engagement ring is a sapphire. I really wanted a coloured stone, rather than "just" a diamond, so in the end I chose one with a rectangular sapphire and 2 (very small) pear shaped diamonds. It is my most favourite material thing in the whole wide world. It is beautiful. So there you go! Obviously I am now meant to nominate another 11 bloggers for the award, but I struggled to do this last time, so this time I'm going to pass. I hope nobody minds. In my previous post, I showed you the lovely items I received from Claire at Ragbags and Gladrags as part of Kerry's Spring Sewing Swap. If you would like to see what I sent to Claire (although prepare to be underwhelmed by the volume of items I sent), she has now posted her link here. For those interested, I bought the buttons and trim from Ruth at The Polished Button, a website on which I love window shopping, as her huge array of vintage buttons matches my enthusiasm for haberdashery! I did also treat myself to a little something at the same time. No idea what I'll use these for, but the colour is so pretty (it's a bit darker IRL) and the shape is really interesting. I always find the selection of buttons in my local shops fairly limited and unexciting - and the ones they do stock that catch my attention are always really expensive - I do not want to spend more on buttons than on fabric, unless they are absolutely to die for. Or made of actual diamonds. 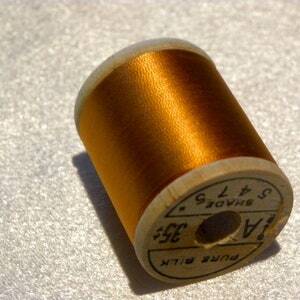 The silk thread that I sent Claire was bought from here, a tip off by Karen from Did You Make That. And once again, I treated myself... well, if you are paying for postage from the US, you may as well make it worth your while! Karen really rated this thread for hand basting, as apparently it's really easy to remove. I wouldn't know because I don't think I can ever bear to use it! I love the idea of it, but I also love the colours and the vintage reels, and so I currently have both reels displayed in my vintage printers tray instead. I probably will, at some point, use the orange (which I bought because the colour is called "ginger", one of my favourite foodstuffs - and just look at the richness of that colour! 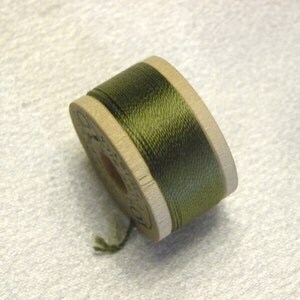 ), but the smaller reel - have you ever seen such a cute thing as this little half height reel? - was bought specifically for display purposes. For the time being though, I like the 2 side by side. In other news, I noticed I had been copied (I'm convinced that's the wrong terminology) on a tweet last week. On further investigation, I realised that someone called Lynn Herrick, who edits (again, terminology?) an online Refashioning and Upcycling newspaper called Refashion Passion, had featured (i.e. 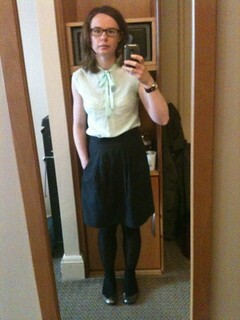 linked to) my recent post about my skirt refashion. And therefore also my holiday pics! While I am chuffed to get the mention and for the blog to receive the exposure, I did make me realised that gosh, what I write and post really is out there on the internet for the whole world to see and to do with it what they will. I always have this awareness, which is why I'm reluctant to feature my family and friends too much, but I guess this really illustrates the point. What about you? How do you feel about putting yourself out there online? Finally, is anyone else having issues with the Bloglovin iPhone app? Before I went off on holiday, I couldn't even open the app and had to de-install and then re-install it to get it to work. Since then, I seem to have an issue whereupon selecting a post to read, the one immediately beneath is opened instead. This is easy enough to work around as I just hit the one above to read the one I want, but annoying because, do you think I remember to do it? The biggest annoyance by far is that I can't comment while still in the app. Instead, I need to open the post in Safari, scroll to the bottom and then comment. But, of course, while I'm in the app, it lets me write the comment, just not publish, so I, again, forget, spend time writing a comment and then immediately lose the lot! I am most definitely losing the will to live with it. Anyone got any ideas or suggestions, other than throwing my phone out of the window finding an alternative blog reader? It has crossed my mind that it could just be that I have an old phone, it being an iPhone 3. Any ideas? Hi! I'm back from our holiday! We were only away for a week, but I feel like I've been away from the blog and the sewing world for so much longer. On Bloglovin I had 434 unread posts! We had a fantastic time. The weather was... dry. Which is pretty good for the East Coast of the UK. I can't say my bikini saw the light of day, but then neither did my cagoule and that makes for a good holiday in my book! We went crabbing, the (wee) boys spent a lot of time digging up and moving around stones, we built sandcastles and ate ice cream. We went to a food festival, we had BBQs, the (big) boys did a brewery tour, we bought art and we went on a 90 second long ferry journey. My nearly-2-year-old niece finally said my name ("Lele" - so cute), we went out for dinner and we walked along the harbour to see the lobsters in the tank at least once a day. I've just reviewed our photos and most of them are of children - we were away with my sister and her family, my brother and my parents, so 7 adults and 3 under 4's. I won't share these as there is nothing worse than photos of other people's children, however here are a few that you may like. As you can see, no sun! But no anoraks either! 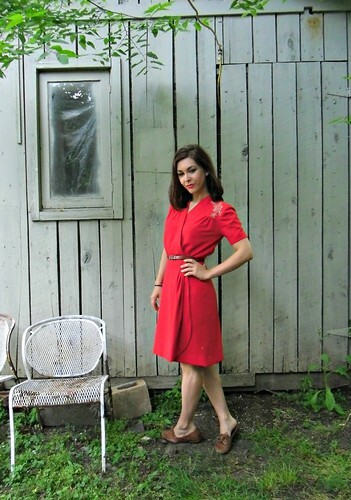 :) And the last 2 photos bring me to my first refashion on this blog... the skirt! I bought this at some point during MMM13, from our local charity "boutique" for £6.50. It's a simple dirndl or gathered skirt, originally from New Look and the print, which you can't see clearly from these photos, is a stripe, mixed with a kind of vague Venice-y type print (gondolas/boats and bridges/viaducts). I loved the print, the colours (I'm totally in love with orange right now) and the style of skirt, so bought it, thinking it would be perfect for my holiday. Now, this is not a refashion that I could remotely compare with the likes of Miss P, or her current Refashioners challenge. 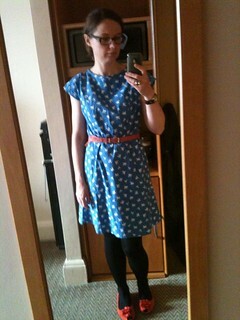 This was a straightforward, perfect as it was skirt, just a couple of sizes too large. The refashion was a simple matter of unpicking the waistband and the gathers. Regathering the skirt, cutting the excess off the waistband and then reattaching it. Simples. It took me 2 evenings to do - actually no, 3, as I did the unpicking on the train back from Leeds the other week. But then I am a really slow sewer. Someone like Miss P could probably do this in 30 mins. In her sleep. One last photo. We stopped off at the Angel of the North on the way back up the road. I have to share this photo because I love this sculpture so much! OK, so it's 2 last photos, but who's counting? As I mentioned previously, we were away in Kendal for the weekend, and then I was away with work (with no photographer) from Monday to Wednesday. So in this, the final week, you get a suddenly diverse array of backdrops, poses and selfies! Eyes closed, because this is the only one P took! In full on Mummy mode, carrying a changing bag and a half drunk carton of smoothie. Blouse: NEW variation of New Look 6351, in blue and white striped linen. Not yet blogged because I only finished it 2 nights previously. 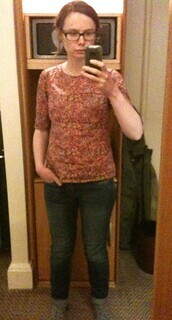 Happy with outfit: 5/5 I really like this new blouse and it was sunny and the first time this year I've worn sandals! Yes, that is a giant lizard shaped kite. Check out the scuba man, which you can just make out - it's the lowest one down and is blue. Rest of outfit RTW and yes it's the same cardigan as yesterday! Happy with outfit: 5/5 I think I've mentioned that this was the outfit I lived in last summer. Looks in good stead for another summer ahead! Backdrop today is the Lake District Visitor Centre, where we spent a good hour throwing stones in the water! Forgot to get P to take a nice photo before he headed off, so you get a bedraggled, tired, caught in the rain 4 times today selfie instead. Happy with outfit: 3/5 I wasn't feeling it for this outfit today. Think it might have just been the weather (rain!) and the fact I knew I wasn't going to see Small Boy or P for 3 days. I got room service and was antisocial and ate chocolate. It made me feel better. Happy with outfit? 5/5 This skirt really does look great with everything! One minor flaw in that I forgot to take my half slip with me, so I had clingy skirt syndrome all day. Happy with outfit: 5/5. The complements just keep rolling in for this blouse. I practically had a girl trying to take it off my back (and then later trying to persuade me to make her one!). This photo solicited my first "dodgy" comment on Flickr! Happy with outfit: 5/5 Love this dress with these orange/coral accessories. I did have clingy skirt syndrome again though! Happy with outfit: 3/5 I worked from home today, and was craving one of my comfy jersey RTW breton tops with these jeans. Instead Small Boy chose this blouse for me. It was OK but nothing to write home about (ironic since I am doing just that!). Happy with outfit: 4/5. I was SO over Me Made May by this point. This was the only day I actually considered not doing it. I really, really, really wanted to just wear jeans and a t-shirt. This seemed like a good compromise. I failed with my final Me Made outfit, as I had nothing appropriate to wear for the day (we were at an offsite meeting which was super casual), but I'm not too bothered by that as it was part of my pledge anyway. 1. Most of the items I sew, I wear to work. I really haven't focussed on making any "casual" items. I use the quotation marks here, because I realise my work wardrobe is relatively casual anyway, and that most of my work items work easily in my weekend wardrobe, but if I've been wearing them all week at work, I don't want to wear them at the weekend too! 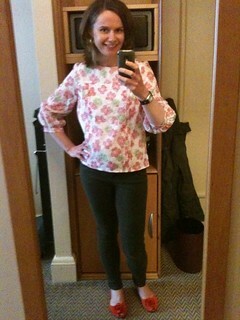 However it has made me realise it wouldn't hurt to have a few more blouses to wear with jeans at the weekend. 2. I started the month, mentally listing all the gaps in my wardrobe as things that I "need" to sew. Half way through the month, I realised I don't "need" to sew anything. I got caught up in other peoples' objectives and pledges and lost sight of my own. I am quite comfortable with buying RTW clothes and will continue to do so. I won't buy something I can easily make, unless there is a really good reason for it, but to buy tees, jeans, trousers, jackets etc is OK. I will continue to push myself and will encourage myself to learn to make these items (jackets and trousers anyway, still not too sure about jeans), so as to expand my skills and develop as a sewer. I will also aim to ensure the items I buy are of quality and known ethical means, or are second hand, but then I'm not a huge Primark shopper anyway. But I am not going to get hung up about it. 3. Panic sewing is stressful! Even the thought of it stresses me out. I pretty much thought about nothing else all May: what would I make next, what were other people making, what fabric, what pattern, when would I find the time to fit it all in!!!!!!!. This was fun for a bit, but since finishing my most recent New Look 6315 variation, which I will blog eventually, I haven't made anything. Mostly this has been because of time, but actually it's probably been good to have the break. Sewing can become a bit all encompassing for me, if I let it. I now need to chill out a bit and be a bit more selective with my projects. 4. Refashioning doesn't really work for me. I bought a couple of charity shop items at the start of the month, with some refashioning plans in mind. They are still both half finished. Not sure if it's lack of vision, the fact that they haven't really turned out as planned, or whether I just prefer sewing from scratch, but I really don't find them to be the quick and easy instant gratification projects that experts like Miss P seem to experience. 5. While the daily photograph documentation was hell, the Flickr group support was amazing and slightly addictive! How nice to have such lovely comments on your outfits most days. My highlight was comments and favourites from Megan Nielsen herself!!!! There are so many lovely, friendly, encouraging and supportive people out there, it reminded me how lucky I am to be part of it. My only regret was that I didn't have the time to look at as many of the photos as I would have liked. I am now on holiday (woo-hoo!). We leave tomorrow lunchtime to drive down to Suffolk, for a week with my family (mum and dad, brother, sister and her family). I don't expect to blog while I'm away, as I'm not sure what the wifi facilities will be like. And even if I do, it will only be gloating photos of us eating ice creams on the beach, and drinking beer on the green! We'll be back in a week or so. See you then!